KBF’s 2018 Angler of the Year (“AOY”) and Rookie of the Year (“ROY”) awards recognize season-long, consistent, outstanding performance and commitment to competition in all three KBF series. This page describes how one earns KBF Angler of the Year (“AOY”) points and gives a general idea of what it will take to beat out three thousand other KBF Members in contention for the 2018 title. Only 2018 KBF Annual and KBF Lifetime Members may earn Angler of the Year earn points. Points are awarded for registering and competing in KBF-sanctioned KBF TRAIL Series and KBF OPEN Series Tournaments, KBF State Challenges and KBF National Challenges. Competitor must have paid his KBF Membership Dues no later than the day before start-of-competition. Joining KBF on the day of an event is too late. No retroactive points are awarded to competitors in OPEN and TRAIL Events who achieve a high ranking and then join KBF afterwards. Limited to 2018 KBF Annual and KBF Lifetime Members who have not competed in KBF Events prior to the 2018 Season. Each series has its own Maximum AOY Points awarded for the highest ranking KBF Member. Decrements remain at maximum until certain threshold registration numbers are hit, and then they start shrinking. Non-members are skipped as AOY Points are awarded going down the ranking. Each series has a “Maximum Decrement,” which is the greatest points step from one position in rank to the next. AOY Points are shown rounded off to the next whole number, though in fact they are calculated to several decimal places. Not every KBF competitive event awards AOY Points. Invitationals (National, Challenge and TRAIL Championships), some Member-only Tournaments (e.g. Bienville Bassin’) and some open-registration, no-point Challenges do not award AOY Points. This will be specified in the KBF Rules Addendum for each Event. KBF Members’ AOY Points Total is the sum of their points from their top two (2) OPEN Series Tournaments, their top five (5) KBF TRAIL Series Tournaments, their top five (5) KBF State Challenges (no more than two per any month) and their top National Challenge (e.g., One Night Stand, Independence Day Challenge, Momanem Challenge). The maximum number of KBF State Challenges that can be counted each month is two, so if one competes in three, four, or more KBF State Challenges in a given month, only the top two scores will contribute toward one’s Challenge category total. When one reaches the max number of Challenges (5 State, 1 National), as higher scores are earned (keeping in mind the State Challenge 2/month limit), the lowest score will be culled. While a preliminary points distribution is announced immediately following each Event, AOY Points awards are not final until the end of the 48 hour Dispute Period during which protests submitted by competitors are reviewed and, in some cases, result in a shuffling in rank with a corresponding change in AOY scores. Scores are reported on the KBF Calendar Event Page after all disputes have been resolved. The final even in the 2018 KBF Tournament Season that awards AOY Points is the Veterans Day Challenge, after which points will be tallied and the 2018 Angler of the Year and Rookie of the Year will be announced. KBF’s 2017 Angler of the Year race was structured in a way that ended in a tie among six top-tier anglers. For 2018, the points structure was revised to make that extremely unlikely. Max’ing out in 2018 will require one to win two KBF OPEN Series and five KBF TRAIL Series Tournaments, five KBF State Challenges, and one KBF National Challenge…virtually impossible to achieve. January 2019 meeting of The TEN will serve as a tie-breaker for first place, should one occur. The 2018 KBF Angler of the Year will meet nine other top-ranked KBF Members in The TEN, a battle of KBF AOY points leaders. AOY and ROY will receive invitations to fish in special KBF invitational events in future years. So, for 2018, KBF TRAIL Series Tournaments work out to 50%, KBF OPEN Series Tournaments 20%, and KBF Challenges 30%, assuming one were to max out in each category. As soon as you’ve launched your kayak onto competition waters, start every KBF-sanctioned competition by uploading to the Tournament Management System (“TMS”) a photo of an empty, approved measuring device (e.g., Hawg Trough) on your kayak with the correct identifier—exactly as you would a regular submission, but without a bass—and submit a score of 0.00″. Why? Doing so identifies you as an active participant rather than just a registrant. 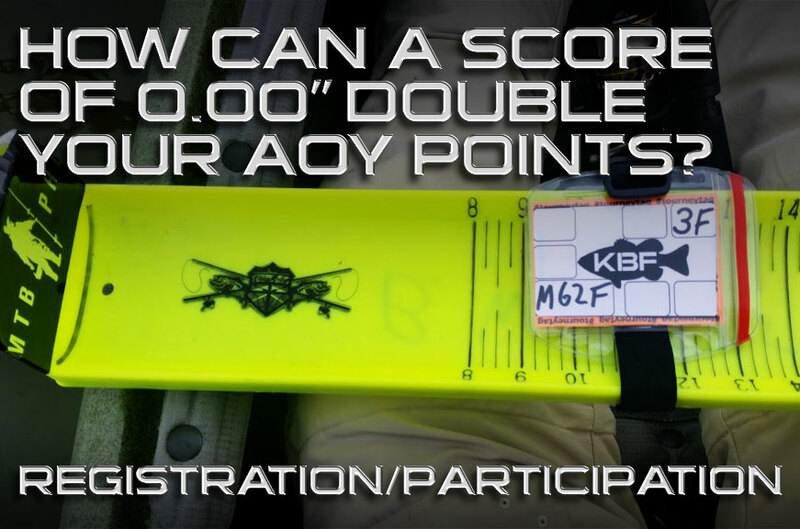 Without even catching a fish, the number of KBF AOY Points you will receive double. Registrants received thirty (30) “AOY Registration Points” for Challenges, sixty (60) for TRAIL Series Tournaments, and sixty (60) for KBF OPEN Tournaments. By uploading the 0.00″ no-bass photo, you merit sixty (60) “AOY Participant Points” for Challenges, 120 for TRAIL Series Tournaments, and 120 for KBF OPEN Tournaments. Going through the photo routine as soon as you’re on the water ensures your measuring board s onboard and intact, your camera is functional, and that you’re able to upload to the TMS app. Uploading a photo also ensures that your name appears on the TMS Leader Board. And that empty measuring board presents you an opportunity to promote a sponsor whose logo appears where a bass normally lies. KBF Management, like everyone else, would prefer a very simple points system. KBF is, essentially, running three separate tournament trails for over a thousand potential competitors scattered across the country, with different population densities and fishing opportunities. Simple is nice…but it doesn’t work. The 2018 KBF AOY Points Plan represents our best efforts to keep the AOY crown, a place in The TEN, and a spot in the KBF TRAIL Championship and KBF Challenge Championship attainable to the majority of KBF Members. We want to make achieving the maximum number of points very difficult, if not downright impossible. At the same time, we want to be cognizant of how the sacrifices in time, travel, and expense involved and not create undue burdens on individuals and families. How do you figure the decrements (drop in points at each step down in rank)? By applying a formula that takes into account the number of KBF Members participating, the number of points awarded reflects both ranking and the difficulty in achieving that rank. Obviously, placing 4th in a competition of five anglers is easier than placing 4th in competition against 50 or 150, so the number of AOY points take into account both rank and degree of difficulty. Basically, one takes the range of “Participant Points” (for example, 100 to 500 for KBF OPEN Series Tournaments) and divides that by the number of Active Participants (those who competed and submitted photos), and then compare it to the maximum decrement. So if the range for an OPEN is 500–100=400, and 200 registrants participate, the we would divide 400÷200, making the decrement “2.” Each step down in rank would receive 2 points less than the one above (500, 498, 496….). If, though, only 50 participants compete, 400÷50=8, which is a pretty big jump. The competitors who showed up to compete deserve more consideration than that, so we’d make the maximum (“4,” for example) the decrement. First place would then get 500 points, 2nd place 496, 34rd 492, and so on. Why do you change the points distribution depending on the number of participants? Everyone prefers a very simple points system. One easy to understand and manage. However, with as many circuits as we run and the incredibly diverse set of variables we juggle, “simple” had to take a back seat to “comprehensive.” What we’ve come up with is fairly understandable while still rewarding performance. One variable is the number of competitors one must beat to win or rank high in an event. Third place in a Tournament with 10 participants is easier to achieve than third place when there are a hundred, and the competitor taking third in the bigger field should earn more AOY points to reflect the relative degree of difficulty. We do that by adjusting the “decrement” (step down in score from one rank to the next). By implementing a points system that awards more points for besting more anglers, and by ensuring that all participating competitors’ scores reflect their relative performance in the event (and exceed the minimal Registration Points) we’ve ensured that the points awarded more accurately reflect the accomplishment. Not perfectly, of course; a 5-bass limit scoring 95.00″ might win a Challenge in one state or one month and place 20th in another. But the points still reflect the performance in the particular event. Are AOY Points awarded to KBF non-members at OPEN and TRAIL Series tournaments? No, KBF AOY Points are distributed only to KBF Members. If a tournament in which KBF Angler of the Year Points are awarded has non-members competing, they are skipped as the AOY points are awarded. The maximum number of points go to the top-ranking KBF Member, and then each KBF Member going down in rank gets successively fewer points, right down to the participant(s) who scored the fewest points, who receive Participation Points. Non-members do not receive points. Even if they join KBF after the tournament, they receive no points for whatever they accomplished prior to joining. If I register but cannot compete, do I get any points? Yes, a minimum number of Registration Points are awarded to each person who signs up and pays the entry fee. So if you sign up for an OPEN Series Tournament, a TRAIL tournament, or a KBF State or National Challenge, pay the entry fee, and then do not attend, the minimum number of points for the event, AOY Registration Points, will be added to your total score (assuming you’ve not already capped-out for the category). That’s 30 AOY Points for Challenges, 60 for TRAIL Series, and 50 for KBF OPEN Series. However, if you compete, you deserve more than the minimum AOY Registration Points, even if you catch no fish. To receive twice that minimum number of points, set up a photo exactly as you would had you caught a bass, but with no fish (empty Hawg Trough, KBF Identifier Form, kayak in background, etc.) and upload it with a score of 0.00″. That will give you 60 AOY Points for Challenges, 120 for TRAIL Series, and 100 for KBF OPEN Series. Isn't earning AOY points just for registering like buying the buying Angler of the Year award? KBF award a minimal number of points per event to every registrant, and while it’s possible that the number of points can affect one’s status in the top 100 (helping to secure a place in the KBF Challenge Championship), they will not contribute enough points to have any impact on who ends up as Angler of the Year or on who ends up in The TEN. KBF’s goal for its AOY program is engagement and participation. We urge everyone to compete in each event for which he signs up, but that doesn’t always work out. They helped ensure their state(s) passed the minimum number threshold and contributed to the prize pot, so we want to recognize their contributions and reward every Member who registered, even if they were unable to compete. If I fish more than five TRAIL Series Tournaments, do my first 5 scores count or my top 5? Fish as many TRAIL Series Tournaments as you wish, but only keep your top five scores. Events with lower scores will be culled, just like you cull shorter fish in a tournament. KBF imposes no monthly limit on the number of TRAIL events; that’s just for Challenges. Are the monthly KBF State Challenges and Special Challenges in the same category this year? Yes, the “Challenges” category includes both monthly State Challenges and the National Challenges. All KBF Challenges award a maximum of 300 Angler of the Year Points, so the most anyone could possibly earn in that category is 1,500 points. All Challenges have each have the same $21 Entry Fee and the same KBF-NC awards and cash prize structure. Within the category are two sub-sets: (a.) monthly KBF State Challenges and (b.) Special Challenges. The final number of KBF State Challenges each month depends on registration numbers. For April, we will create a KBF State Challenge for each of the contiguous 48 US states. To hold the event, 10 or more KBF Members must register in each state. After some combining of states with fewer than the 10-registrant minimum, we may end up with 35 or so. A KBF Member may fish as many different of these as he likes; however, just his top two scores each month will count toward his AOY Point total. So if in April one fishes the GA, FL, and SC Challenges and earns 100, 94, and 20 points, respectively, then KBF will cull the lowest score (25 for SC) and keep the other two (GA 100 and FL 94), totaling 194 AOY Points. Since the State Challenges run from April through October (seven months), one can retain points from no more than fourteen KBF State Challenges. How many Challenges can I fish, and how many will help my AOY Points score? KBF imposes no limit on the number of Challenges for which a KBF Member may register. With around 220 Challenges scheduled for 2018, and your top five (4 state/1 national) counting in the AOY Race, you’ll have plenty of opportunities to maximize your AOY Points score. No matter how many monthly State Challenges you sign up for or compete in, only your top two scoring events count. If you compete in three, four, five or more states in a given month, scores for all except the top two evaporate. Since these run March through October, you’ll have as many as seven x two (14) KBF State Challenges that can help you build up your AOY Points. KBF will run seven One Night Stands, which KBF considers “Special Challenges” along with six or so other Challenges scattered throughout the season. For the AOY Race, which includes opportunities to win a berth in The TEN, the maximum number of Challenges that one may count is 14. All fourteen of them can be State Challenges, of they can be a combination of State and Special Challenges. For the 100 Challenge championship on Toledo Bend in November, up to 20 Challenge scores count. If you compete in State Challenges through six months (April through October) and keep your top two scores each month, that’s twelve (12). We’ll hold six more One Night Stands. Now you’re at 18. Throw in four or five other Special Challenges during those months and you’re at 21 or 22 Challenges…meaning that you can cull just a one or two scores, tops, to establish your points score that counts for the 100 Challenge Championship. That event takes place on Toledo Bend, concurrent with the “End on the Bend” KBF OPEN the first weekend in November. The October State Challenges wrap up only three or four days before you need to pack up and drive to Many, Louisiana for that. 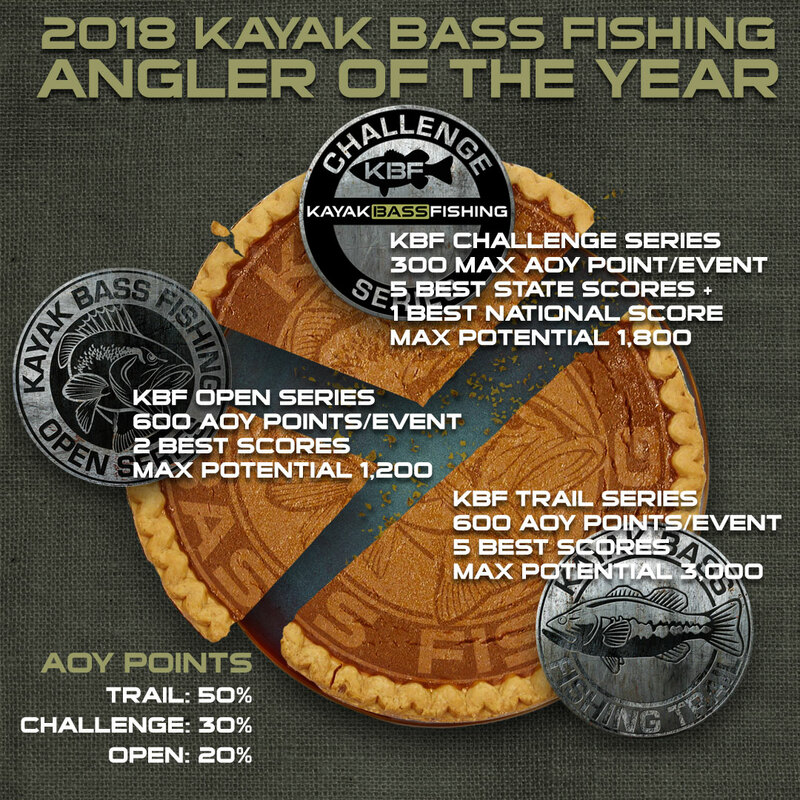 Which AOY Points count toward an invitation to the KBF CHALLENGE Championship? Only AOY Points earned in KBF Challenges determine who gets invited to compete in the KBF CHALLENGE Championship. Scores from each KBF Member’s top four State Challenges and top four National Challenges will count. I think I earned more points than what you show in the totals column. Where did they go? Each category of competition has a points cap. It could be that you earned more points in a single category than the cap. If so, all points over the cap spill off and don’t contribute to your total. You assumed points not awarded. Not all competition provides points. For instance, KBF AOY Points were not awarded at KBF Members Only – Bienville Bassin’ in January. Refer to the Event page on this website and on TourneyX. Miscalculation. Check your points and tally them up again. First place gets the maximum for the event, second place fewer points, and each place below gets less. We might have goofed up. That happens sometimes, like when anglers changed the spelling of their name on their TourneyX account so our spreadsheets sort the points into two accounts rather than one, or we failed to award points where earned. If you think you’ve found a mistake, we’ll be happy to check and correct any errors. Email Joe Haubenreich at KBF, explain the discrepancy, and ask him to investigate. Do KBF Partners distribute KBF AOY Points to their members this year? No, not in 2018. In 2016 each KBF Partner organization had some points to distribute among its active members and/or event participants, but in 2017 and again this year all KBF AOY Points must be earned in KBF-sanctioned Challenges and Tournaments (KBF OPEN and TRAIL Series). When is the 2018 KBF Angler of the Year race over? The KBF AOY Points Race ends mid-November, following the Veterans Day Challenge. When will the AOY and roster for The TEN be published? Points will be verified by independent audit, and results announced the third week in November. We don’t want to rush through the process and make any mistakes but will publish the results as soon as we can. What happens if someone ties for Angler of the Year? A tie is not very likely considering how much time and travel would be required to achieve this feat. But let’s acknowledge the possibility, anyway. KBF has a plan in case two or more angler max out with 6,000 points or the top two or more end up with exactly the same number of AOY Points. We will coordinate with those anglers to break the tie at The TEN in January. The winner of the fish-off would be crowned 2018 AOY. What happens if one of The TEN or KBF Challenge Championship anglers cannot compete? As soon as KBF is notified that a KBF Member invited to compete in The TEN cannot complete, his invitation will be rescinded and rolled down to the first alternate (eleventh place in rankings). If the first alternate cannot compete, KBF will roll the invitation on down to the second alternate, and so on down the list of alternates until the full complement is met. There are no roll-downs for the KBF TRAIL Championship or the KBF Challenge Championship.